It’s not every day you stumble upon a menu that has something very rarely seen in most countries. This alone is reason enough for me to try it out, but when that thing is also a delicious sounding burger, the temptation is only leading one way- sitting down and ordering said burger. To settle your confusion- yes burgers are common place, however… camel burgers- they are not. Yep, whilst NN and I were venturing out of our bubble for lunch, I did a little searching and happened upon Kazbah. 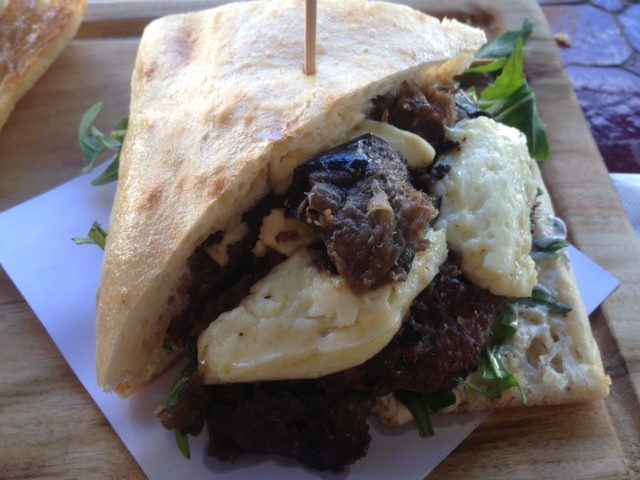 I skimmed through their menu, liking what I saw throughout, however, it was The Camel Burger that really caught my eye. That, you definitely don’t see every day. Unless you work at Kazbah, then you probably do. 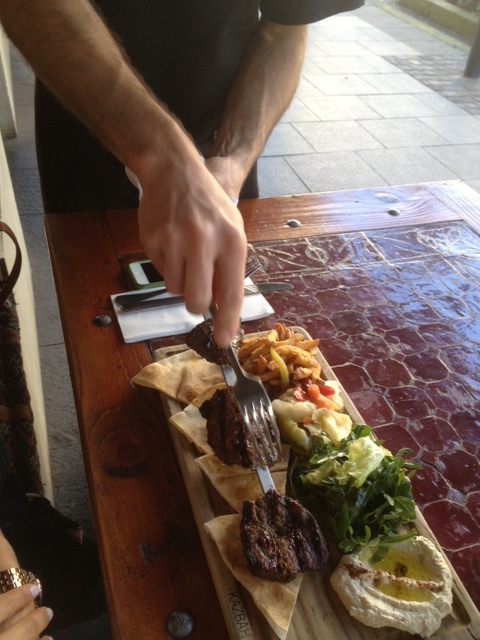 So it was settled, lunch- and week 29 of our 52 eats- would be at Kazbah, so I could dig into a camel burger. 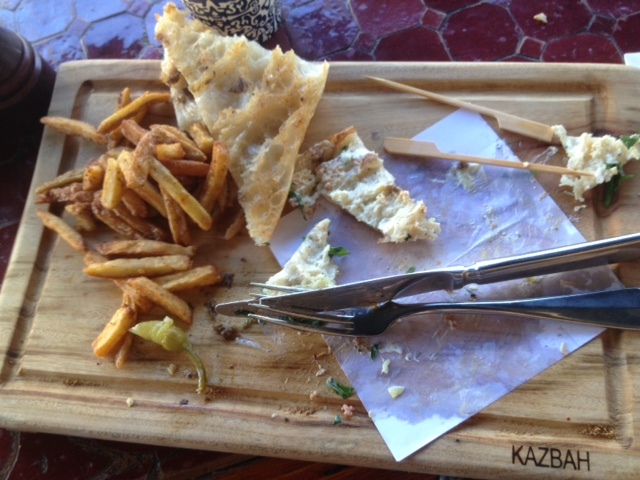 Kazbah is set on a busy street in Balmain. It opens out onto the footpath and has a nice atmosphere and feel. This was superfluous for me, however, as I was there for one thing only. Still, we sat down and went through the menu. 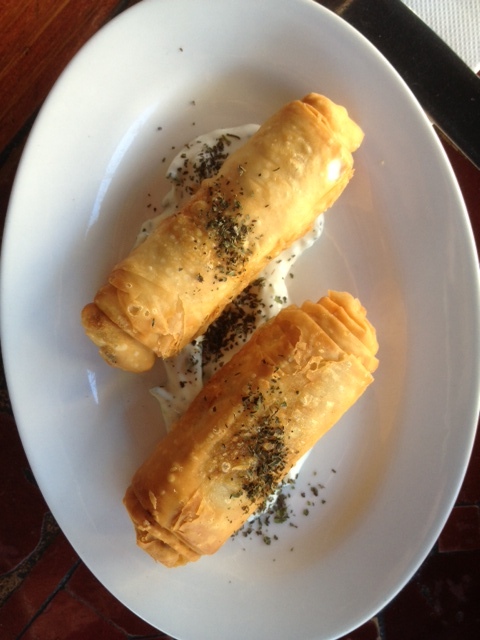 NN eventually came to a decision with the aid of the waiter, and we also ordered a couple of the small mezze starters; Char-Grilled Quail with Pomegranate Sauce and the Spicy Lamb & Pine nut Borek with Tzatziki. As you might be able to imagine, I was quite happy with the reality of 3 meats in one lunch sitting. And I was. 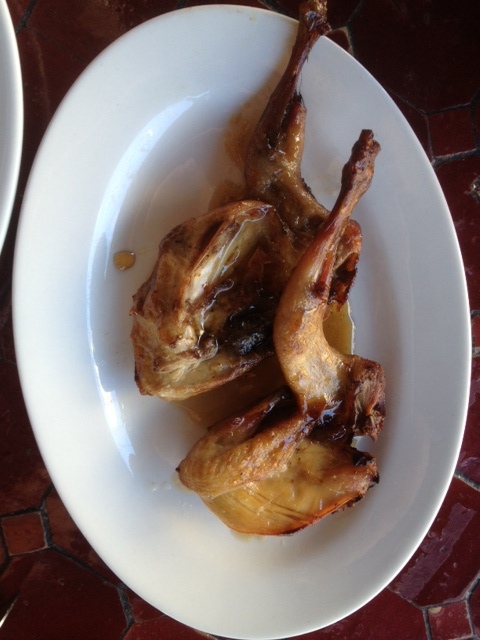 The little lamb parcels were great, as was the quail, if frustratingly finicky as is standard with these tasty little birds. So, our dishes arrived, my burger looked quite the feat to finish off- a challenge. However, it was at this point I found myself thinking- what will I talk about for the blog this week, an unplanned one- purely taken by the idea of eating camel. As long time readers and those capable of making reasonably safe assumptions will know- I obviously ate camel at one point last year, and it didn’t fare too well. Basically I got a tough piece of meat and I didn’t really do it justice. The result was a frustrating meal. Now enter the monstrous burger from a well regarded restaurant, and I was excited, if a little apprehensive, seeing my past experiences. This time round the result was definitely worlds past my own effort, however, for me it is probably not really a flavour I will chase down too many times again. This may sound odd, but I feel that if you were brought up on camel meal, or at least you had eaten often and enjoy it more than beef, then you would love this burger. It just didn’t really nail it for me. Still, this was a chance to try something rare, something most people would never do, yet something I encourage everyone to do. Not necessarily try camel, which I assume wouldn’t be that likely after my description above, but something, anything you would normally avoid or wouldn’t normally find on the menu. Getting outside your comfort zone when ordering from a menu is usually the last thing on someone’s mind, but you might just find a new favourite food or meal. You will also provide yourself with a whole new combination of nutrients which your body wouldn’t have come across before. For you, this could be instrumental in your health. For me, I don’t think camel is exactly that, however, it is a different source of protein and micronutrients, that once I largely left the chips and bun of the burger alone, made for a lunch my stomach hadn’t seen ever before. Change is as good as a holiday, and variety in your diet is just as good. Kazbah, definitely worth a try. Camel burgers- also definitely worth a try. What meat or dish have you tried lately that you never normally would have? And if there’s nothing on that list, make sure something is soon! With so much rambling going on, I will keep this short and sweet. Camel burgers, not so much. I too was intrigued with this particular dish and as such our entire lunch was based around MCs devouring of said burger. My meal, which was a beautiful beef shish kebab with pickled veggies, was predominantly forgotten about as we pondered MCs Camel burger. To be honest, I couldn’t really taste the ‘Camelness’ of the meat, granted my meat palate is nowhere as sophisticated as Meat Mike (Mike’s note- no, no it’s not J), but I thought there would be some sort of distinguishing flavour. If I were told that I was eating a beef burger I would’ve believed it. The highlight of my lunch was the pickled vegetables, delicious sweet/salty/sour flavours that were the perfect way to cut through the meaty beef. It seems, that in the past few months, I have been craving meat-free days, (yes MC knows about this, and hopefully isn’t something that’ll effect my relationship with him) and I’ve been craving more and more vegetarian meals. As you know, I am a big believer that cravings are your body’s way of telling you something. So after some investigation with my Naturopath, it turns out that my liver is not functioning efficiently (blood tests were taken), and as a result I cannot handle the amount of fat or protein in the meat thus I’m craving vegetarian foods. My body knows what it needs to help it heal itself. So just remember, if you are craving foods that are outside your norm, and these cravings continue for a period of time, take that as a sign that you may need further investigation from a professional such as a naturopath or holistic nutritionist. And that has been brought back, good work NN. See you all next week, where we visited a favourite Australian beach town and did you one naturally does- eats, drinks and relaxes! Tried venison tongue at Foveaux the other day…probably like you and the camel – glad I tried it but probably wouldn’t have it again – not like ox tongue which is just awesome! Interesting! Will have to give that a try.